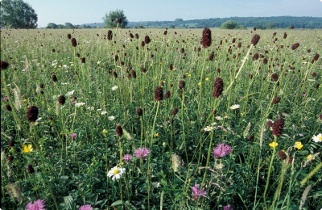 Floodplain meadows are part of a quintessentially English landscape that would have been found throughout Britain's river valleys 100 years ago. Throughout the spring and early summer, they are awash with wildflowers and waving grasses, humming with insects and the birds that depend on them. They provide a vibrant and beautiful spectacle that was once taken for granted, but has now all but disappeared. They have evolved over many hundreds of years through the need to sustain cattle, sheep and especially horses over the winter months, by storing the summer grass crop as hay. The annual cut in midsummer followed by grazing, prevents the taller coarser species from becoming dominant and has created the diverse flower-rich sward we see today. They were a particularly valued part of the agricultural system. Because they receive regular silt deposition from river floods, the nutrients removed in the hay crop are replenished naturally without the need for artificial fertilisers. This naturally high fertility enables the grasses to continue to grow strongly after the hay cut, allowing grazing of the 'aftermath' during August and September. Traditionally cattle grazed the meadows through the autumn with sheep in winter if the soil was not too wet. Nowadays, the few remaining meadows serve a variety of purposes. As well as generating a prized hay crop, they also provide an important nectar source for pollinating insects such as bumble bees. We recognise their value as areas for flood storage and they act as sources of seed for the restoration of meadows across the country. They are a small reminder of a traditional, rural landscape and have a critical role to play in the conservation of our natural heritage.